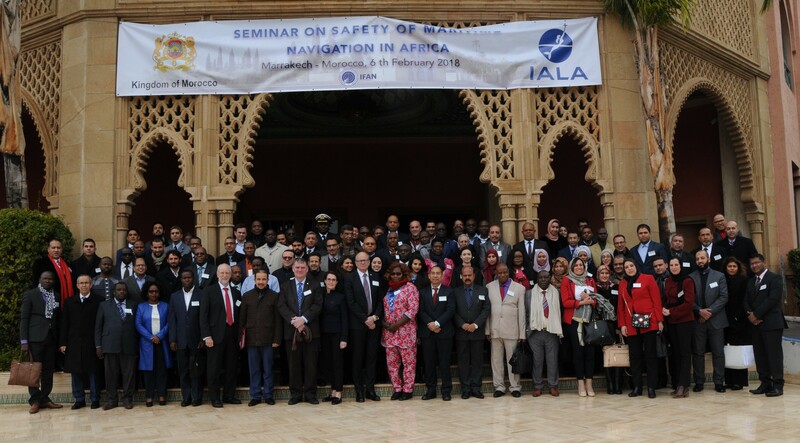 A one-day Seminar on Safety of Maritime Navigation in Africa was organised with the Ministry of Equipment, Transport, Logistics and Water in Marrakech, Kingdom of Morocco, back to back with the Second Preparatory Diplomatic Conference (6, 7 and 8 February 2018, Agdal Mogador Conference Centre, Marrakech, Morocco). The Technical Director of the Maritime Organisation for West and Central Africa (MOWCA), Colonel Mariko Mamadou, chaired the opening ceremony and thanked Morocco for hosting so well the event. The Dean of the IALA World-Wide Academy, Mr. Omar Frits Eriksson, indicated that Coastal State representatives are not alone; the Academy is there to educate and train; deliver missions, reviews and advices; and facilitate risk assessment. The responsibility belongs to them, Coastal States, and decisions makers should be aware. According to more than 30 needs assessment missions, the lack of resources and of structures is evident to allow implementing top-level management actions. The economic value of safety of navigation (health, goods, assets, lifes, …) is underestimated. The Academy needs the help from attendees to make available a good awareness level, and to know how to go further. Colonel Mariko Mamadou highlighted the importance of the cooperation between countries and international organisations. This first seminar organised for the African Region has been a success, with 109 participants, 79 from 16 African countries, 18 from 7 other countries, 10 from 4 international organisations and 2 from 2 IALA industrial members.